Choose the best for your chafers with Choice chafer 2 hour gel fuel, the hottest and longest burning ethanol fuel on the market! Made from 200 proof gelled ethanol and capable of producing 1630 BTU's per hour, its gelled formula provides a higher heat output than conventional wick fuels and allows approximately 2 hours of burn time. It is also easy to light, odorless, and burns clean without leaving residue. It delivers high-quality heat that burns hotter, longer, and safer than comparable fuels. This fuel is very good. The container is a great size for long parties that have food that needs to be kept warm. The flame is also a nice size that wont burn or cool down your food. We do a lot of catering orders and more and more people are wanting chafing dishes. I would recommend this fuel brand as it actually lasts the 2 hours it says it does! best price and the quality is the same or better than far more expensive products. they will hold heat under chaffers for hours on end! This fuel is the reason I joined the Plus program. This item alone is saving me hundreds of dollars. My local source charges more than twice the price for a similar product, and we go through TONS of these. Very happy with the product, but especially with the price! Great price for the amount you receive, I wish I had started purchasing earlier instead of using the big box stores. They last 2 hours and burn very hot. I use these for all of my caters. Very very reasonably priced and they get the job done. I never have any problems with his fuel. They light quickly too. True to the product description, each fuel tin lasts exactly two hours. Under stable conditions, the chafer stayed plenty hot. Though these do not blow out in moderately windy conditions, there is significant heat lost. I will have to figure out a wind block for my chafers on windy days at the market. Great deal on chafing fuel. I bought this case so I wouldn't have to place another order for a long time! This fuel is going to be great for our new chafing units also purchased here on Webstaurant! Excellent product. About $15 cheaper than if you buy from your food supplier. Local food distributors want to overcharge for these kinds of nonfood products. This fuel is great if you're setting up a spread of food and you need it to stay warm for a couple hours. Set it up under your chafing stands, light the gel, and use the lid to adjust how much of the flame is exposed. This chafing fuel is great not only for the price point, but also for the burn time and BTUs that it outputs. I was a diehard user of Sterno branded fuel before.. Not any more! Choice is my go to! Great chafing dish fuel with a convenient 2 hour window. Those 2 hours are sufficient for just about all of our catering needs. No more keeping 6 hour cans for other caterings without knowing how long they're going to last. Excellent Chafing Gel Fuel! I would definitely purchase again. Used for parties. Chafing Gel kept food hot and gel burned consistently. Great product for price. I used this choice ethanol fuel to warm up my desserts. Does not product any smells that's the good part. It last long and does not go out easily. Love it! The Ethanol Gel Chafing Dish Feul worked great for heating our chafers. They lasted as expected and kept the food warm. i would recommend this product to anyone who caters. Very happy with product quality. Margins tight on most products but your price on sale recently unbeatable. My only regret is I did not buy more!! These chafing fuel are great for the price! The lids pop right off. As long as they are stored in a cool place they are great and won't dry out. This is an economical fuel that works well for all of our catering needs and lasts long enough for all of our drop off and full service catering orders. We used these at our wedding. We had about 11 chafing dishes and used 2 gel fuels per dish. It kept the food steaming hot for several hours and had extra fuels left over that we will use at our next event. These worked GREAT. We had warm food for three hours! NO smell, NO mess...Just did what it was supposed to. And...it last more than 2 hours! Will definitely purchase again. These are a great price, especially if you purchase a full case. One note: did have an issue with shipping but Webstaurant was awesome! Thanks!!! I used these for the first time and am now planning on always useing these. They are so easy to light and they burn for a long time. And a great price too! We really like this fuel. Clean burning and gets very hot. Seemed to burn out quickly so next time, we will adjust the flame more efficiently. Great price too. So far so good! We use these for caters off site and they have been great. No horrible odors and easy to light. They work as well as many of the other brands with a much better price point per case. We go through a lot of chafing dish fuel, and for the price it is just as good as any other fuels that we have used. I recommend these to anyone. These are a great, cheap and effective kitchen tool. They hold up for just over Two hours and have the thermal heat to keep the chaffe hot the whole time. This fuel is very economical and long lasting. Though we purchased them a while back, we still have more than enough to last us in the future. Great price. Heavy case! But the product was top notch -- great VALUE for money. At this price, lasted long and served its purpose. I bought three cases because I thought they wouldn't last long but we had one case left over. Cheaper than other retail outlets. The Choice Ethanol Gel Chafing Dish Fuel worked very well for our banquet, we needed to serve 155 people and the fuel kept the food at a great temperature. These Ethanol Gel Chafing Dish Fuel really keeps the food nice and hot. Actually my son pulled off doing an outside wedding using these. He actually was able to use them to cook the food since there were no stoves or ovens to complete the task. Everything went more than great and everyone,especially the bride was very very satisfied with everything,especially the food. It could not have been done without these Ethanol Gel fuel. Pro's- burns nice and hot for the whole 2 hours. Keeps buffet food nice and hot. You can't beat the price. Cons- has a very strong odor to it. Recommend using in well ventilated area. Very happy with this product. Reliably burns the full 2 hours with consistent heat output even when used for outdoor catering set ups. 2 thumbs up! These work just like regular sternos at what... 20% of the price? I can't believe I've been paying much more for the branded ones. These are going to save me a lot of money! I bought these because my catering business typically does lunches and our chafers are only needed for about 2 hours. I had a call from a customer informing me that they had to put these out and they thought I should know because the smell was so bad from them. When I got to the office about an hour later the smell was still throughout the office. I would not get this product again. We appreciate your review, Roberta! If you are having any issues with the product you have purchased, please contact our Customer Solutions team. Great heat from a well priced product. We use these at all of our catered events and they burn well and are easy to light. These fuel cans are great for any catering company or anyone that runs a buffet. The don't put off any odors when burning and go well over the two hours. Perfect for heating chafers for a short time. Not to high or hot to over cook, but not too low to allow food to chill. Odorless and easy to lite. The price is great on these choice ethanol gel chafing fuels. While I didn't need 72 of them for an upcoming event, it was much cheaper to buy the case per item in the long term. I will use them eventually, and ethanol fuel doesn't expire or go bad. Worth stocking up on! This gel fuel works great with my chafer. It does last long and keep my food hot. I brought a whole case of 72 of them and stored them in my garage till I need it, super convenient and great price! Great Product!! No Odor!! Heats fast for a 1/3 of the cost of the other major brands. Will be stocking up for Christmas catering season. 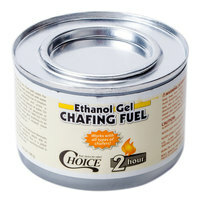 The 2 hour ethanol gel chafing fuel is not only a great price but very good quality product. Very nice even burn, no need to spend more on other fuels. perfect for doing catering jobs or even for the family party that needs to keep food warm, they give off very good heat and maintain the heat. This is the only chafing fuel we will order. Its cheap and they always light and burn evenly. I have been able to relight these even after we put them out. Overall good product. Best deal I've found anywhere! "Sternos" get very pricey and Ii was so happy when I found this product. It does the job just as well as the other competition and YES, I would buy it again in a heartbeat! I use them on most catering jobs to prevent running cords when ever possible. They light easily and work great. Using these year round will save us a ton of money in the long run. I like that this item comes in a variety of burn time. There is no waste! Best deal out there if you're a caterer. "sternos" from our local supplier sometimes get's very high in season. Always check with webstraunt for any paper goods first. the choice ethanol gel chafing fuel is a good and wonderful product its clean no smug and you can do money things like boil water and warm your food . For the money these are great! These work well for weddings and events where we are not trying to keep food warm for an extended amount of time. Oh these right very easily and lasts very long! Great purchase and I will definitely be buying more in the near future. Does last for 2 hours +. We were very pleased with the gel chafing fuel. I prefer the gel to wicks, and the price was a good value compared to our local wholesale shop. I find that in general, they'll burn longer than 2 hours so I keep my leftovers for pre-heating the Cambros..
Great price on chafing fuel - box arrived slightly damaged but 90%+ of the fuel canisters were in good shape. Burns hot for over 2 hours. this 2 hour gel chafing fuel at 72 per pack is a great deal. they work much better than the wick fuel. and they light so much easier as well. great value for a great product. So glad that I switched to these gel fuels from the wick type. The wick type kept blowing out when I catered in windy conditions. Great item. Very economical We have found they burn hot for at least two hours often more. Easy to light and no liquid to worry about if they are knocked over. Love the short time of these fuels, use it for a 2 hour service and then discard/recycle. So much easier that starting a service with partially full fuel. The one drawback is that each container will burn from 1:40 to 2:15 hrs as opposed to dependably 2 hours. Great brand of chafer fuel! Long lasting flame is sure to keep food hot! Nice for keeping a small pot of water simmering to quenelle ice cream! !